I’m sorry this is a little belated but I’d like to express my thanks and gratitude to you and Adam for your very professional and attentive service you provided for the late Mr & Mrs Lee last Thursday. I know son John was overwhelmed at the thought of his beloved Mum & Dad travelling together for their final journey. The fire truck looked a treat. Hope the drive home wasn’t too taxing. Alex Bouton, Funeral Director, Co-op Funeralcare, Preston. Hi Eddie, I would like to thank you and the team at Warrington Fire Station for your courtesy and assistance today. The parent`s of little Noah were overwhelmed by everything that was done by everyone. Its people and professionals like yourselves that allow parents to celebrate their children`s lives without thought it was a great honour to work with such great people. Just a quick note to thank you for your services on Tuesday. The family also asked me to pass on their thanks. 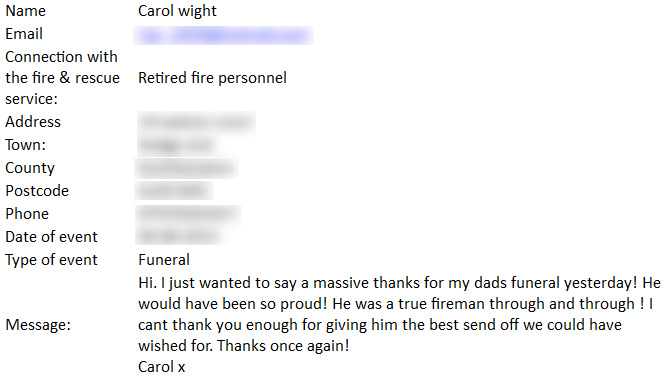 They were delighted with the fire engine and the whole service you provided. I am writing to thank you for allowing a group of members from The Fire Brigade Society to make a visit to view your collection of fire appliances on Saturday 8th May 2010. Several of our members had travelled many miles to Shropshire from Hampshire, Suffolk, Yorkshire and even Scotland and were not disappointed by the standard of appliances and equipment on show or by the hospitality given to them by you. Mention must be given to the excellent condition that you had prepared the appliances to and I’m sure that given better weather the ‘polished’ bodywork would have stood out even more! Good luck with the rest of the â€˜work in progress’ on the ex London Emergency Tender which I’m sure will come up to the excellent standard of the rest of the fleet. Our group look forward to many more interesting visits to your collection over the coming years. Dave Smith, Midlands Area Secretary, Fire Brigade Society.